Click the assignment to view the Grading Summary, which will show the number of participants and submissions. Then click View/grade all submissions (below the assignment or in Assignment administration on the left). The submissions table appears. The submission table lists all students and their submissions. In example 1 below, blind marking has been applied so submissions are identified by number, whereas in example 2 there is no blind marking so each submission has full identifying information. More information on the Submissions table. Before starting marking, you need to make sure that the process is not visible to students. See Hide and release Grades and Feedback. 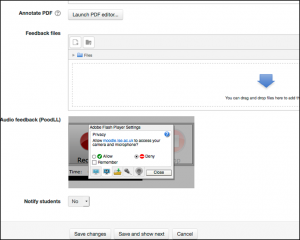 Whatever method of grading and feedback you opt for, you are likely to need to download student submissions. From the Submissions table above, click the drop down on Grading action (top left) and select Download all submissions. Submissions will automatically download to your computer as a .zip file. Locate the zip file on your computer and unzip it. All files will automatically be renamed and prefixed with students’ names or blind marking numbers. Files will open in the format submitted by the student e.g. Word, PDF. Online text assignments will appear as html files and can be opened in a browser or with Word. N.B. If you are planning to add feedback to each submission and then upload using ‘Bulk feedback file upload’ (described below), make sure you do not change the file names. 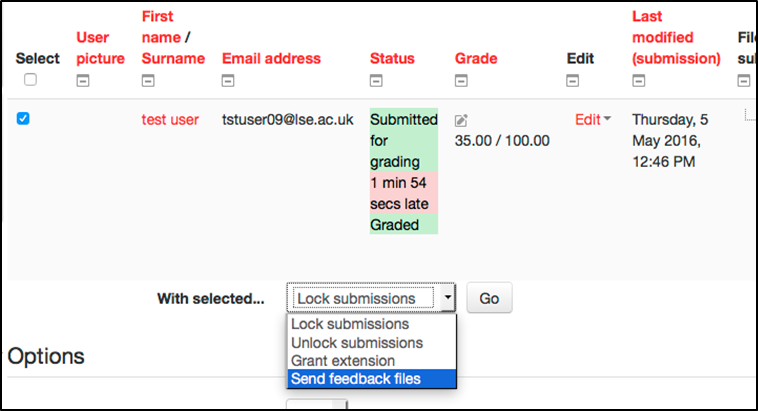 Quick Grading Add grades and feedback directly to the submission table. The submission table lists all students and their submissions. 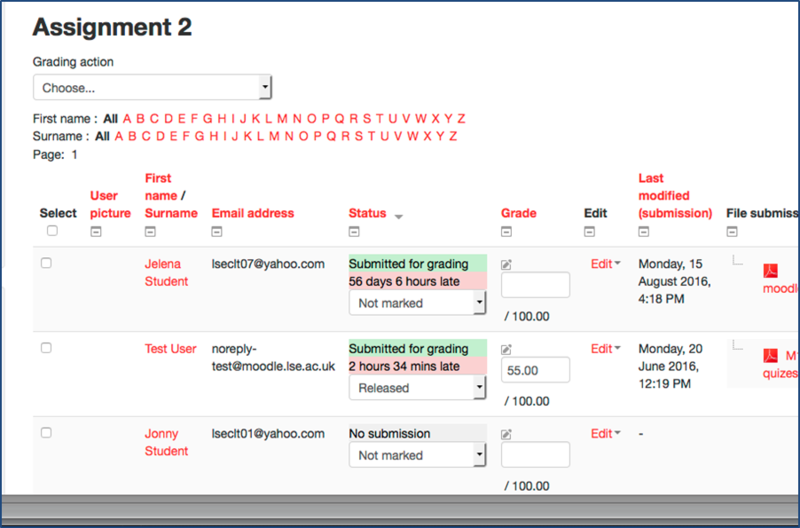 Quick grading enables you to add grades and feedback on the same screen for all listed students, rather than requiring you to access each submission record individually. Use to add marks and quick feedback comments. You may want to use it in combination with bulk feedback file below. Individual feedback file upload Send feedback files to students individually Can be done in combination with one of the grading options above. However, you may want to consider the bulk option below if you have large numbers of students. Bulk feedback file upload Make comments on submission files (e.g. Track Changes in a Word document, or annotating a PDF), and then return to students in bulk via the assignment. Use when you want to provide feedback on the actual submitted work. Use in combination with a grading option e.g. Quick grading or offline grading worksheet. Offline Grading worksheet Grade submissions (and add feedback comments) without being logged in to Moodle (or connected to the Internet). You download a spreadsheet from Moodle, add grades and feedback comments and then upload it back into Moodle. It is not available for assignments using Rubric or Marking Guide. You may want to use in combination with bulk feedback file upload. N.B. All options above are compatible with blind (or anonymous) marking. Click the pencil icon in the Grade column (of the submissions table) for a particular student. 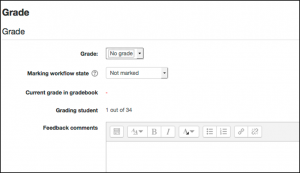 Add a Grade, change the Marking workflow state if used, and add Feedback comments. Select Quick Grading in Options at the bottom of the submissions table. This has the effect of showing input boxes for Grade and Feedback comments. Enter grades and feedback comments as required. (You may want to use filtering options to make the screen easier to work in.) If you have not already, you may want to download student submissions for reference (see above). Once you have completed your entries, make sure you click Save all quick grading changes below the submissions table. This will result in a confirmation message. Click Continue. You are not likely to use this method when marking a batch of submissions but may find it useful for ad hoc feedback e.g. on a late submission. Click the Select box for a student on the submissions table and then select Send feedback files on the With selected… drop-down below and Go. Upload the feedback file(s) by drag & drop or browsing for it using the icon highlighted below. You can upload one or more files this way e.g. annotated student submission, completed front sheet, feedback text. Once the file(s) are uploaded, click Send feedback files. N.B. The process below must be followed precisely and can only be carried out on files downloaded according to this download process. Otherwise Moodle will be unable to match feedback files to submissions. Once you have downloaded the student files, enter feedback for each downloaded student file using your chosen method e.g. annotated PDF, Word tracked changes. Zip all the files ensuring that that file names of the downloaded submissions are not changed. Then open the submissions table for the relevant assignment and select Upload multiple feedback files in a zip from Grading action top left. Browse (or use drag & drop) to locate the zip file, and click Import feedback file. Check it is the correct one and Upload file. Then click Import feedback files. Finally click Confirm to action the import (there is a lot of checking as getting this wrong could have serious consequences). You then get a message confirming the number of files added etc. Click Continue. N.B. If you get a message saying ‘no changes’ this means something is wrong with the files being uploaded. Check to make sure file names have not been changed. 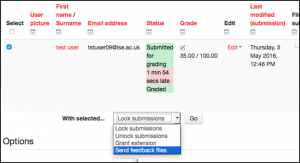 The updated/new feedback files will appear in the Submissions table under Feedback Files for all students involved. Sort submissions by Status so all students with submissions are at the top. In the Grading action drop-down at the top left of the Submissions table, select Download grading worksheet. Ensure that the file names of the grading worksheet are not changed. N.B. If the Download grading worksheet option is not visible, you need to select Offline grading worksheet in Assignment settings. The worksheet will download to your computer as a .csv file. Open the file in Excel and do the following. (This is essential if you are going to transpose marks and feedback from your own results sheet, but is useful even if you are not). Delete all the rows for those students who have not submitted anything and sort by Full name (if no blind marking is set up) or Identifier (if blind marking is selected). If relevant, open your own results sheet in Excel and sort by name or identifier. Then, check that the number of rows is the same in your sheet as in the grading worksheet; and, if relevant, that people with the same first name are in the same order in both sheets. Correct any differences. 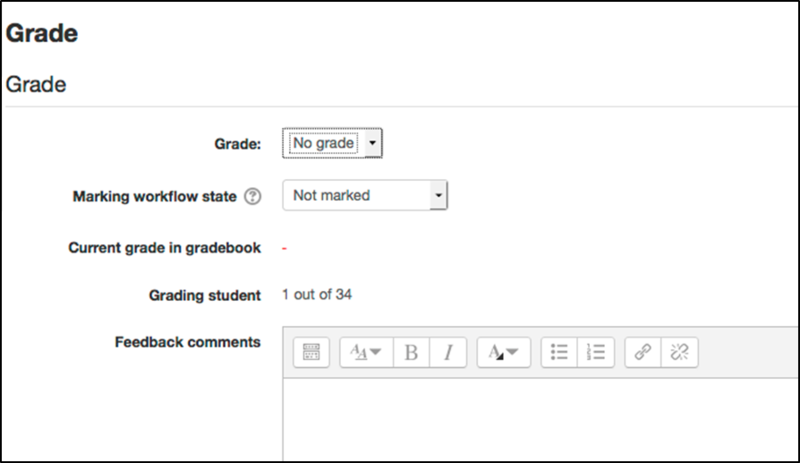 If you are adding grades and comments directly to the grading worksheet, enter them now in the Grade and Feedback comments columns respectively. Otherwise, copy and paste the grades and feedback across to the relevant columns of the grading worksheet from your results sheet. 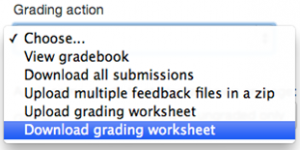 Return to the Submissions table and on the Grading action drop-down, select Upload grading worksheet. On the next page, drag and drop your modified grading worksheet file from your computer into the file area. Alternately, click Choose a file… to find and select your worksheet file for upload. If any errors are reported during the upload process, fix your grading worksheet file and try again. Once uploaded successfully, all grades and feedback comments should appear against relevant students. Finally, make sure that grades and feedback are released to students. See Hide and release Grades and Feedback.